When chocolate and vanilla are this good, why choose? Have both in one! 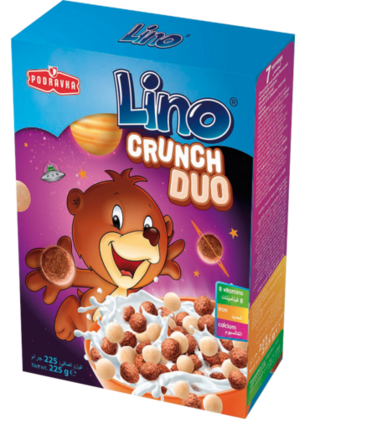 These tasty cereal balls combine chocolate and vanilla flavours in one delicious breakfast that will have both kids and adults coming back for more. Best of all, it’s highly nutritious and enriched with 8 vitamins, iron and calcium. Pour 30 g product with 125 ml of warm milk (45 °C) and stir. Cereal balls with chocolate flavour 70% [61% cereals (wheat grits, whole wheat flour), sugar, cocoa powder 5.1%, dextrose, crude vegetable oil, calcium carbonate, table salt, vitamins (vitamin C, niacin, pantothenic acid, vitamin B6, vitamin B2, vitamin B1, folic acid, vitamin B12), aroma, iron pyrophosphate and emulsifier: soy lecithin], cereal balls flavored with vanilla 30% [67% cereals (wheat grits, whole wheat flour, corn grits), sugar , dextrose, hardened vegetable fat, whole milk powder, calcium carbonate, common salt, flavoring, emulsifier: soya lecithin, iron pyrophosphate].